No, this is not deja vu. Well, it is but it isn’t. This may technically be the same album as the one I just wrote about, but there’s a two-inch difference that is rather significant. Does size matter? To the music! I’ve talked about ten-inch records before, but to avoid being called lazy, here’s a succinct history. In the early to mid-1950’s, ten-inch records were standard format for jazz albums. Sure, there were twelve-inch records being made in the late 40’s, but those were the medium of classical music albums. The old shellac 78rpm discs were ten inches, so why change. As the 50’s marched on, more people got hip and realized “why pay $4 for 15 minutes of music when I can pay $4 for 30-plus minutes of music?”; the ten-inch record’s days were inching away. By 1960, the ten-inch was on tentative ground. The bigger medium won. Quite a few jazz labels reissued their ten-inch albums onto the 12-inch format, adding new tracks to fill out the record. In the process, some tracks were left off, or in some cases entire albums never saw another reissue, and thus remain available only as rare 10-inch albums. 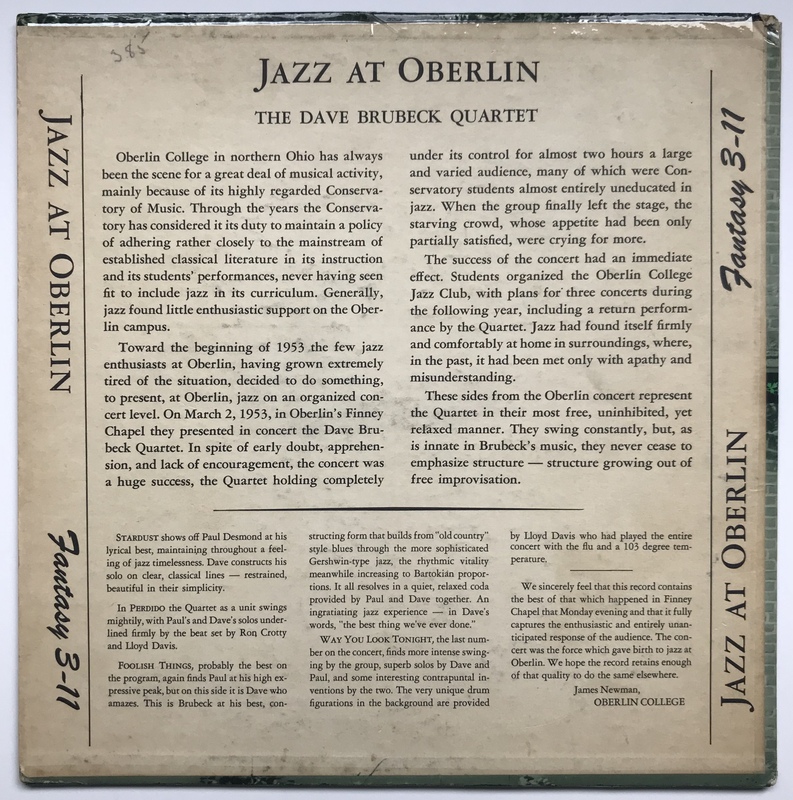 In 1953, Fantasy released part of a Brubeck concert taped at Oberlin College as a 10-inch album. Due to space, it only had four songs, two on each side. The last tune on the record (and if you believe the liner notes, the last tune of the concert) is “The Way You Look Tonight”, and while this song appears numerous times in Brubeck and Desmond’s discography, the group has a particularly smoking encounter on this occasion. Desmond especially reaches a zenith never again met on record, pouring out line after line of connected musical thought. This solo is considered by some to be his absolute best, and it’s not hard to see why. Besides playing in a more extroverted manner than usual, his solo is laden with quotes and references to other songs and compositions. For instance, right out the gate and only 17 bars into the song itself, he fits a few bars of the Stan Getz tune “Signal” in such a way that it seems more natural that Stan Getz borrowed the song from Desmond’s phrase. In the ensuing choruses, Desmond manages to weave in references as varied as a Mexican folk song to Stravinsky. Speaking of this concert, Dave Brubeck called Desmond’s performance “perfection on fire”. I’ll have to write a ‘Desmond’s Quotes’ about it someday. Brubeck’s solo is impressive as well, and in classic Brubeck fashion builds from fleet single-notes to full, thundering chords. As he builds to these thundering chords, Brubeck begins toying with the tonality, moving from the major key to the minor. Before long, he’s stumbled into a jazzed-up version of Greig’s “In The Hall of the Mountain King”, which is not lost on the classically-schooled Oberlin conservatory student audience. As quickly as Brubeck references Edvard Greig, he’s off improvising counterpoint in the fine tradition of Bach. Desmond comes back in for some more counterpoint, then the arrangement takes them out. It’s also worth pointing out that Brubeck’s arrangement of “The Way You Look Tonight” is pretty groovy in that at the end, when it’s just sax and bass, Desmond is playing the middle (B) section while Crotty is simultaneously playing the main theme (A section). Who knew they could work together? As I mentioned before, as the 10-inch record format lost ground to the 12-inch record, many record labels simply reissued the 10-in albums as full LPs, tacking on other tracks to fill it out. And then there was Fantasy Records, always making things difficult and unorganized. 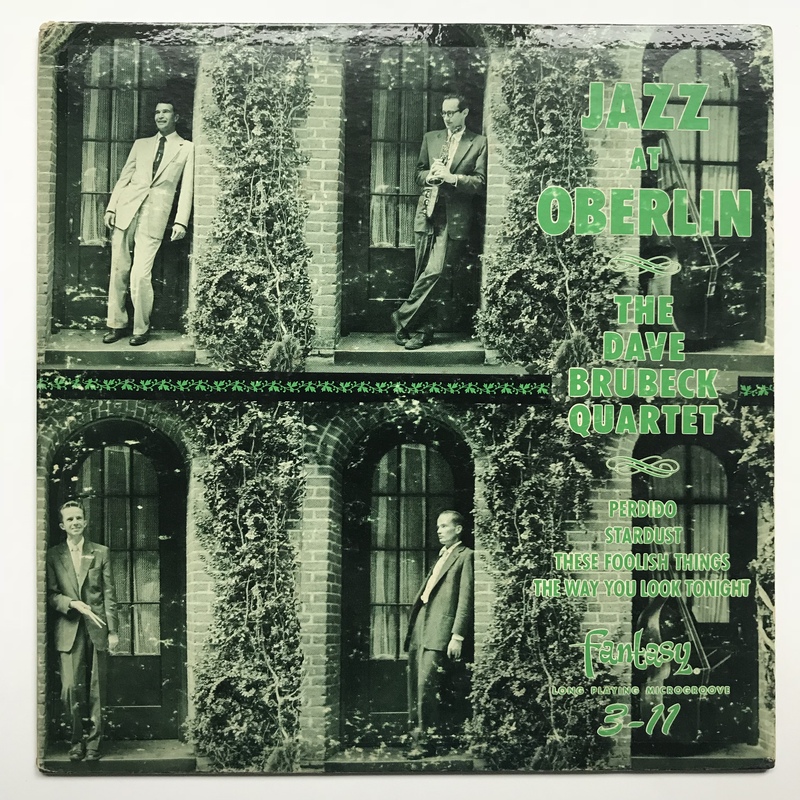 In 1953, Fantasy put out the 10-in album of ‘Jazz At Oberlin’, featuring four tunes. In 1958, Fantasy added another track from the Oberlin concert (“How High The Moon”) and reissued ‘Oberlin’ as a 12-in record. Between 1953 and 1958, Fantasy released “The Way You Look Tonight” as a two-sided 7-in 45rpm single. When putting the track onto the 45rpm disc, the good folks at Fantasy decided to make an edit to the track. When the 12-in album was released, the edited version was used, and has been used on each subsequent release. Why the edit? Who knows. Some have suggested that it was a matter of fitting the song onto the small 45rpm disc. Others have posited that fitting it onto a bigger LP necessitated the edit. Perhaps. The track was almost 9 minutes without the edit, it makes sense that an edit might be needed to squeeze it onto a 45, but an LP can comfortably handle 20 minutes of music per side. I personally suspect that the edit was made to the track for the single release, and due to Fantasy’s haphazard manner of operation, the original tape was lost, so they HAD to use this doctored track on subsequent reissues. Consequently, the only way to hear the complete version of “The Way You Look Tonight” is by listening to the 10-inch album. It looks like size really does matter. In jazz record collecting, anyhow. The edit in question completely omits Desmond’s first full chorus. Here’s the track as it was originally heard on the 1953 10-in album. Compare that with the edited track as heard on the 1958 12-in album and all other releases. Sharp-eared listeners will hear the edit at the 1:13 mark. At first glance, it’s identical to the 12-inch cover art, but at second glance, differences can be seen. For example, the print is green here, which makes it on the verge of blending in with the rest of the picture. The tastefully-arranged band members in the doorways with the bass at the far right makes for an aesthetically-pleasing cover, though. A stranger who had never heard of the Dave Brubeck Quartet would be able to pick Brubeck out of the group with that white suit. And people said Dave Brubeck was a square dude. How square can you be if you own a tailored white suit? Excuse me, my phone is ringing. Hello? You say your name is what? Coronal Sanders? The back is in fact identical to the 12-inch album, except that that album had the new track listing on it. James Newman contributes some stellar liner notes for a Fantasy Records album. Not only does he include the location (gasp) but the COMPLETE date!!! Give the man an award. It’s worth noting that the liner notes make note of drummer Lloyd Davis had a healthy fever running at the time of the concert. In spite of it, he and the group went on and recorded one of the best records in the Dave Brubeck Quartet’s discography. This is particularly fascinating when one realizes Brubeck’s other concert album that has gone on to legendary status, ‘At Carnegie Hall’, was made while then-drummer Joe Morello had a fever. Coincidence? I think not. Again, Fantasy has to be different. According to the label and record numbering (and NOT from a convenient ‘side 1/side 2’ marker), side one and side two are the exact opposite of what the liner notes say. The track numbering on 12-inch record is different as well. Like Cab Calloway’s famous song, it’s record madness. This particular album, like most of Fantasy’s early releases, was pressed not only on red vinyl, but on emerald green, a light purple, and a cobalt blue. Unfortunately, I never seem to find these other colors. It’s only the red and stereo blue for me. Being an early-50’s pressing, it’s a deep-groove record in mono. The mix could be better, and in fact was improved on later reissues. Of course, it could be said that the equipment that this record was played on back in ’53 probably couldn’t reproduce a sound as faithful as a modern setup. Well “modern”. Modern is relative. My record player was made in 2018, the stereo receiver in 1974-76, the speakers in the 1990s, and my ears shortly thereafter. What is modern? Can the definition of modern ever be out of date? While we’re at it, what’s the meaning of life? One of these posts, I’ll actually say the name of my local record store. It’s a crime how absolutely loaded with gems it is. Like, this is Alabama. How? Then again, who cares. I’m blessed and counting my blessings. This was one of those times where I quietly cursed under my breath when I found this record in the bin. Every record collector has that moment, some more than others, some louder than others. You’re minding your business, casually flipping through the records at your local store not expecting anything, when suddenly a 1500-series Blue Note pops up and says hello. 10-inch records are my personal 1500-series Blue Notes, especially when it’s Dave Brubeck. After a series of minor heart attacks (the record inside this album belonged to Gerry Mulligan, then I found the Gerry Mulligan album with the Brubeck record inside it). The original price of $3.85 was written on the back of the record, which made the current price of $12 seem unfair. Then I got home and ran it through the inflation calculator. Mercy. $3.85 in 1953 comes to exactly $36.26 in today’s market. Suddenly, that $12 seems just fine. For fun, I calculated what $3.85 would be in 1953. $0.41. Where’s that time machine so I can buy brand new records?! Great post. As usual here.